Dr. Clare Aslan is a community ecologist and conservation biologist, interested in the ecology and conservation of species interactions and how dynamics at the interaction level can scale up to the full community level. She is passionate about solutions-oriented research. ​Dr. Aslan's current research interests include the community implications of species interaction disruption via climate change and biologic​al invasions. She comes to NAU from the Arizona-Sonora Desert Museum, where she managed a research program examining the impact of resource scarcity on mutualisms in desert endemic plants. Her previous research focused on mutualisms between native and non-native species in California and Hawaii. Mitigating the impacts of global change on ecosystems requires a mechanistic understanding of the processes underlying patterns of biodiversity. The Beckman Lab investigates interactions between plants and their environment occurring over multiple scales and examines the role of these interactions in limiting plant populations and maintaining biodiversity. Many of these interactions are disrupted by global change, and they examine the consequences of these disruptions for plant communities and ecosystem functions. The Beckman Lab use a combination of theoretical, empirical, and quantitative approaches to address their research questions. Dr. Beckman earned her Ph.D. in Ecology, Evolution, & Behavior at the University of Minnesota, Twin Cities and B.S. in Biology at Washington and Lee University. She was a Postdoctoral Fellow at the Mathematical Biosciences Institute and the National Socio-Environmental Synthesis Center. 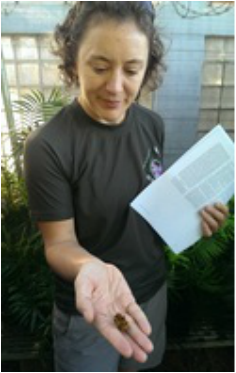 Dr. Rogers is a tropical forest community ecologist and conservation biologist, motivated by a desire to understand and effectively address environmental problems. Her research investigates the impact of biodiversity loss on ecosystem services, with a focus on mutualisms and food web dynamics in tropical forest ecosystems. Dr. Rogers finished her PhD in the Department of Biology at the University of Washington in 2011, then moved on to a Huxley Fellowship in the Department of BioSciences at Rice University in Houston, TX, and is now an Assistant Professor in the Ecology, Evolution and Organismal Biology Department at Iowa State University in Ames, IA.